Grant us, we pray, O Lord our God, the constant gladness of being devoted to you, for it is full and lasting happiness to serve with constancy the author of all that is good. Through our Lord Jesus Christ, your Son, who lives and reigns with you in the unity of the Holy Spirit, one God, for ever and ever. According to the 1962 Missal of St. John XXIII the Extraordinary Form of the Roman Rite, today is the feast of St. Felix of Valois, one of the courageous companions of St. John of Matha in the foundation of the Trinitarian Order for the redemption of captives in the hands of the Moslems. He died in 1212, at the motherhouse of the Order in the diocese of Meaux. Historically today is also the feast of St. Bernward of Hildesheim, a Benedictine bishop, architect, painter, sculptor, and metalsmith. Also, it is the feast of St. Edmund who was elected king of the East Angles in 855 at the age of fourteen and began ruling Suffolk, England, the following year. Felix, born in 1127, and John of Matha founded the Order of Trinitarians for liberating captured Christians from Saracen slavery. He belonged to the royal family of Valois. The breviary recounts several marvelous events from his life. As a boy he frequently gave away his clothes to clothe the naked. He pleaded for the life of a murderer condemned to death and foretold that he would reform and lead a highly edifying life-which prophecy proved true. With St. John of Matha he journeyed to Rome at the bidding of an angel and requested permission from Pope Innocent III to found a religious Order (1198). During holy Mass the Pope was granted a revelation regarding the proposed foundation; an angel appeared to him clothed in white with a red and blue cross. At Innocent's bidding the Order took the name of the Blessed Trinity. In the newly-founded monastery at Cerfroi, Felix was favored with a visit by the Blessed Virgin. During the night preceding the feast of Mary's Nativity all the brethren slept through Matins by a special divine dispensation. Felix alone appeared at choir, where he found the Blessed Virgin clothed in the habit of the Trinitarians, accompanied by a great throng of angels similarly dressed. United with them, with Mary as choir leader, Felix recited the Office as usual. When he was about to leave the earthly choirs to join those of heaven, an angel foretold to him the day of his departure; he admonished his brethren to persevere in love toward captives and the poor, and died on November 4, 1212, mature in age and merit. Often Portrayed As: old man in Trinitarian habit with a coronet at his feet; Trinitarian with a stag nearby; Trinitarian with chains or captives nearby; with Saint John of Matha; with the Holy Trinity. Learn more about the Trinitarian order. The Trinitarians are working in Sudan today, read the Bishop of El Obeid, Sudan's lecture about the persecution in his country, pray for the modern martyrs and if possible send a donation. St. Felix was a man of deep prayer, spend an hour before the Blessed Sacrament. Cook an authentic Sudanese dinner. Saint Berward served as the thirteenth Bishop of Hildesheim, Germany during the middle of the tenth century. His grandfather was Athelbero, Count Palatine of Saxony. After having lost his parents, Bernward was sent to live with his uncle Volkmar, Bishop of Utrecht. His uncle enlisted the assistance of Thangmar, the pious and learned director of the cathedral school at Heidelberg, for the boy's education. 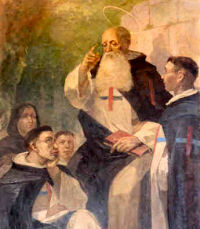 Under the instruction of Thangmar, Bernward made rapid progress in Christian piety as well as in the sciences. He became very proficient in mathematics, painting, architecture, and particularly in the manufacture of ecclesiastical vessels and ornaments of silver and gold. Saint Bernward completed his studies at Mainz, where he was then ordained a priest. In leiu of being placed in the diocese of his uncle, Bishop Volkmar, he chose to remain near his grandfather, Athelbero, to comfort him in his old age. Upon his grandfather’s death in 987, he became chaplain in the imperial court, and the Empress-Regent Theophano quickly appointed him to be tutor of her son Otto III, who was only six years old at the time. Bernward remained at the imperial court until 993, when he was elected Bishop of Hildesheim. His knowledge and practice of the arts were entirely employed in the service of the Church. A man of extraordinary piety, he was devoted to prayer as well as the practice of mortification. Shortly before his death in 1022 he was vested in the Benedictine habit. He was canonized by Pope Celestine III in 1193. Though from the time of King Egbert, in 802, the kings of the West-Saxons were monarchs of all England, yet several kings reigned in certain parts after that time, in some measure subordinate to them. One Offa was king of the East-Angles, who, being desirous to end his days in penance and devotion at Rome, resigned his crown to Saint Edmund, at that time only fifteen years of age, but a most virtuous prince, and descended from the old English-Saxon kings of this isle. The saint was placed on the throne of his ancestors, as Lydgate, Abbo, and others express themselves, and was crowned by Hunbert, bishop of Elman, on Christmas-day in 855, at Burum, a royal villa on the Stour, now called Bures or Buers. Though very young, he was by his piety, goodness, humility, and all other virtues, the model of good princes. He was a declared enemy of flatterers and informers, and would see with his own eyes and hear with his own ears, to avoid being surprised into a wrong judgment, or imposed upon by the passions or ill designs of others. The peace and happiness of his people were his whole concern, which he endeavoured to establish by an impartial administration of justice and religious regulations in his dominions. He was the father of his subjects, particularly of the poor, the protector of widows and orphans, and the support of the weak. Religion and piety were the most distinguishing part of his character. Monks and devout persons used to know the psalter without book, that they might recite the psalms at work, in travelling, and on every other occasion. To get it by heart Saint Edmund lived in retirement a whole year in his royal tower at Hunstanton, (which he had built for a country solitude,) which place is now a village in Norfolk. The book which the saint used for that purpose was religiously kept at Saint Edmundsbury till the dissolution of abbeys. The holy king had reigned fifteen years when the Danes infested his dominions. The Danish Chronicle relates, that Regner Lodbrog, king of Denmark, was taken prisoner, and put to death in Ireland, which he had invaded. Harald Klag, who had fled from his tyranny to Lewis Debonnair in Germany, and received the Christian faith, succeeded him, but relapsed into idolatry. After him Syward III, and Eric I, and II, reigned; the latter, towards the end of his life, was converted to the faith by Saint Anscharius. In his time the sons of Regner Lodbrog, after having subdued Norway, laid England waste. Their names were Eric, Orebic, Godfrey, Hinguar, Hubba, Ulfo, and Biorno, who, with mighty armies which they collected in the northern kingdoms, all commenced adventurers and pirates. Hinguar and Hubba, two of these brothers, the most barbarous of all the Danish plunderers, landing in England, wintered among the East-Angles; then, having made a truce with that nation, they in summer sailed to the north, and, landing at the mouth of the Tweed, plundered with fire and sword Northumberland, and afterwards Mercia, directing their march through Lincolnshire, Northamptonshire, and Cambridgeshire. Out of a lust of rage and cruelty, and the most implacable aversion to the Christian name, they everywhere destroyed the churches and monasteries; and, as it were, in barbarous sport, massacred all priests and religious persons whom they met with. In the great monastery of Coldingham, beyond Berwick, the nuns fearing not death, but insults which might be offered to their chastity, at the instigation of Saint Ebba, the holy abbess, cut off their noses and upper lips, that, appearing to the barbarians frightful spectacles of horrors, they might preserve their virtue from danger: the infidels accordingly were disconcerted at such a sight, and spared their virtue, but put them all to the sword. In their march, amongst other monasteries, those of Bardney, Croyland, Peterborough, Ely, and Huntingdon were levelled with the ground, and the religious inhabitants murdered. In the cathedral of Peterborough is shown a monument (removed thither from a place without the building) called Monk’s-Stone, on which are the effigies of an abbot and several monks. It stood over the pit in which fourscore monks of this house were interred, whom Hinguar and Hubba massacred in 870. The barbarians, reeking with blood, poured down upon Saint Edmund’s dominions, burning Thetford, the first town they met with, and laying waste all before them. The people, relying upon the faith of treaties, thought themselves secure, and were unprepared. However, the good king raised what forces he could, met the infidels, or at least a part of their army, near Thetford, and discomfited them. But seeing them soon after reinforced with fresh numbers, against which his small body was not able to make any stand, and being unwilling to sacrifice the lives of his soldiers in vain, and grieving for the eternal loss of the souls of his enemies, who would be slain in a fruitless engagement, he disbanded his troops, and retired himself towards his castle of Framlingham in Suffolk. The barbarian had sent him proposals which were inconsistent both with religion and with the justice which he owed to his people. These the saint rejected, being resolved rather to die a victim of his faith and duty to God, than to do anything against his conscience and religion. In his flight he was overtaken and surrounded by infidels at Oxon, upon the Waveney: he concealed himself for some short time, but, being discovered, was bound with heavy chains, and conducted to the general’s tent. Terms were again offered him equally prejudicial to religion and to his people, which the holy king refused to confirm, declaring that religion was dearer to him than his life, which he would never purchase by offending God. Hinguar, exasperated at this answer, in his barbarous rage caused him to be cruelly beaten with cudgels; then to be tied to a tree, and torn a long time together with whips. All this he bore with invincible meekness and patience, never ceasing to call upon the name of Jesus. The infidels were the more exasperated, and as he stood bound to the tree, they made him a mark wantonly to shoot at, till his body was covered with arrows, like a porcupine. Hinguar at length, in order to put an end to the butchery, commanded his head to be struck off. Thus the saint finished his martyrdom on the 20th of November, in 870, the fifteenth of his reign, and twenty-ninth of his age; the circumstances of which Saint Dunstan learned from one who was armour-bearer to the saint, and an eye-witness. The place was then called Henglesdun, now Hoxon, or Hoxne; a priory of monks was afterwards built there, which bore the name of the martyr. The saint’s head was carried by the infidels into a wood, and thrown into a brake of bushes; but miraculously found by a pillar of light, and deposited with the body at Hoxon. These sacred remains were very soon after conveyed to Bedricsworth, or Kingston, since called Saint Edmundsbury, because this place was Saint Edmund’s own town and private patrimony; not on account of his burial, for Bury in the English-Saxon language signified a court or palace. A church of timber was erected over the place where he was interred; which was thus built, according to the fashion of those times. Trunks of large trees were sawn lengthways in the middle, and reared up with one end fixed in the ground, with the bark or rough side outermost. These trunks being made of an equal height, and set up close to one another and the interstices filled up with mud or mortar, formed the four walls, upon which was raised a thatched roof. Nor can we be surprised at the homeliness of this structure since the same was the fabric of the royal rich abbey of Glastenbury, the work of the most munificent and powerful West-Saxon kings, till in latter ages it was built in a stately manner of stone. The precious remains of Saint Edmund were honoured with many miracles. In 920, for fear of the barbarians under Turkil the Dane, in the reign of king Ethelred, they were conveyed to London by Alfun, bishop of that city, and the monk Eglewin, or Ailwin, the keeper of this sacred treasure, who never abandoned it. After remaining three years in the church of Saint Gregory in London, it was translated again with honour to Saint Edmundsbury, in 923. The great church of timber-work stood till King Knute, or Canutus, to make reparation for the injuries his father Swein or Sweno, had done to this place, and to the relics of the martyr, built and founded there, in 1020, a new most magnificent church and abbey in honour of this holy martyr. The unparalleled piety, humility, meekness, and other virtues of Saint Edmund are admirably set forth by our historians. This incomparable prince and holy martyr was considered by succeeding English kings as their special patron, and as an accomplished model of all royal virtues. 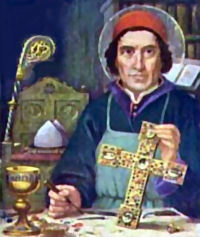 Henry VI who, with a weak understanding in secular matters, joined an uncommon goodness of heart, made the practice of religion the study of his whole life, and shared largely in afflictions, the portion of the elect, had a singular devotion to this saint, and enjoyed no where so much comfort, peace, and joy as in the retreats which he made in the monastery of Saint Edmundsbury. The feast of Saint Edmund is reckoned among the holidays of precept in this kingdom by the national council of Oxford, in 1222; but is omitted in the constitutions of Archbishop Simon Islep, who retrenched certain holidays in 1362. No Christian can be surprised that innocence should suffer. Prosperity is often the most grievous judgment that God exercises upon a wicked man, who by it is suffered, in punishment of his impiety, to blind and harden himself in his evil courses, and to plunge himself deeper in iniquity. On the other hand, God, in his merciful providence, conducts second causes, so that afflictions fall to the share of those souls whose sanctification he has particularly in view. By tribulation a man learns perfectly to die to the world and himself, a work which without its aid, even the severest self-denial, and the most perfect obedience, leave imperfect. By tribulation we learn the perfect exercise of humility, patience, meekness, resignation, and pure love of God; which are neither practised nor learned without such occasions. By a good use of tribulation a person becomes a saint in a very short time, and at a cheap rate. The opportunity and grace of suffering well is a mercy in favour of chosen souls; and a mercy to which every saint from Abel to the last of the elect is indebted for his crown. We meet with sufferings from ourselves, from disappointments, from friends and from enemies. We are on every side beset with crosses. But we bear them with impatience and complaints. Thus we cherish our passions, and multiply sins by the very means which are given us to crucify and overcome them. To learn to bear crosses well is one of the most essential and most important duties of a Christian life. To make a good use of the little crosses which we continually meet with, is the means of making the greatest progress in all virtue, and of obtaining strength to stand our ground under great trials. Saint Edmund’s whole life was a preparation for martyrdom. See the full text of ""Saint Edmund king and martyr: a history of his life and times with an account of the translation of his incorrupt body, etc, from original mss"